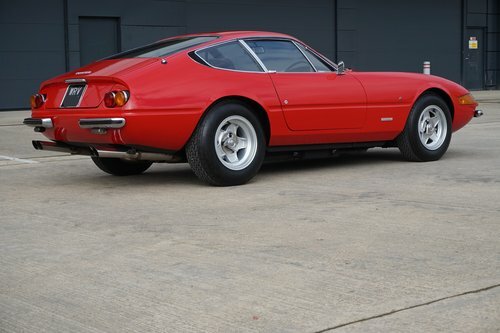 Keys Motorsport are very proud to offer this Ferrari 365 GTB/4 Daytona for sale on behalf of our client. The car we present before you today is an outstanding example with continuous history from day one. 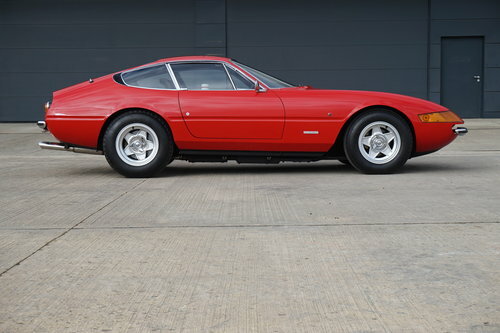 This RHD Daytona (1 of 158 UK supplied cars) was delivered to a Mr D. Dobbie of Perthshire on the 3rd of August 1972 through the UK distributors Maranello sales of Egham. Finished in Rosso Chiaro with black interior and specified with air conditioning. The original delivery invoice to Maranello Concessionaires from Ferrari Modena is present in the vast history files as is the invoice from Maranello to the first owner. The car was once owned by Sir Elton John who purchased the car on 20th Aug 1973 and kept it until 1975, this is documented in the history file. 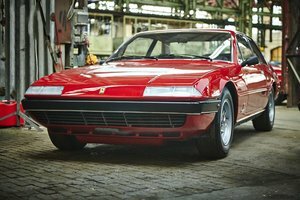 The extensive record keeping that the cars former custodians have up kept is astonishing, in the two files of history that accompany the car are invoices from 1972 all the way up to 2018 and MOT certificates from 1977 onwards, fully documenting the cars genuine mileage of 81,000 miles. Highlights contained within these files are invoices for an engine rebuild, a gear box re-build, suspension work and a body renovation as well as copious amounts of routine service and maintenance work. The former keepers have also kept Fuel receipts, expired tax discs and magazine extracts on the Daytona. 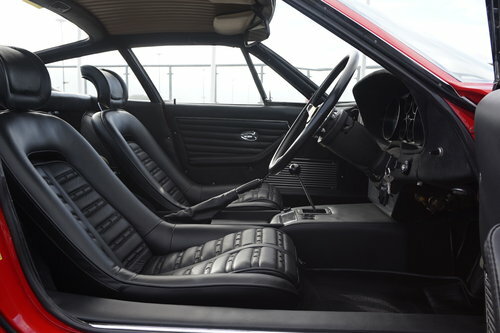 The car comes complete with its original build/ delivery sheet outlining the cars specification, chassis number, engine number, original leather document wallet and original hand books. 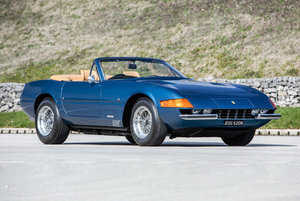 This car features one of the most comprehensive history files I have seen on a Ferrari of this vintage. The Rosso Chiaro paintwork is in flawless condition, the paint has a wonderful deep lust to it and the panels are all free from ripples, dents and scratches etc. The panel gaps are exactly as they should be and the car is equally as tidy in the door and bonnet shuts. The chrome work is in excellent corrosion free condition and the glass is equally as good with the correct stampings present and correct. Finished in nero leather with nero carpets the interior is in marvellous condition having benefitted from a re-trim a few years ago, the quality is excellent and all original fixtures and fittings as well as switch gear are present and correct, the only deviation from total originality is a discreet immobiliser that has been installed for obvious reasons. Dynamically, everything functions exactly as it should and on the road the cabin feels remarkably civilised. 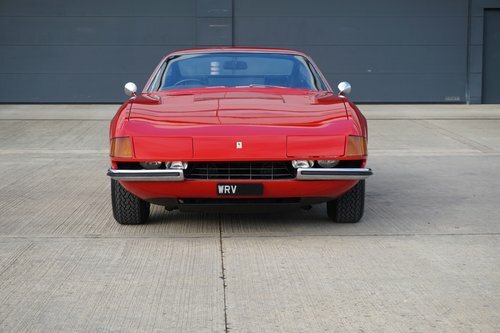 The 4390cc V12 engine is capable of propelling the Daytona to a top speed of 174MPH which made this the fastest production car in the world at the time of its release, the car still feels fast now and has a charisma to its engine that puts it in a class of its own. The engine fires up with ease and idles smoothly, the oil pressure is optimum at all temperatures and speeds and the car runs at the correct temperatures. The car benefitted from a service in 2017 and will be supplied with a fresh major service and tappet adjustment carried out in our Silverstone based workshop prior to delivery to a new owner. The engine bay is presented in lovely original condition with all factory correct finishes and fixtures. The 5 speed gearbox is a joy to operate and each gear can be selected with satisfying precision, the car benefitted from a gearbox overhaul some years ago and a new clutch in 2014, we have just replaced the release bearing which all adds up to a gearbox/ clutch system that operates faultlessly. The original magnesium wheels are present and correct and were refurbished approximately 2 years ago, they are still in excellent condition. The car wears the correct Michelin XWX tyres which have clearly travelled very few miles. The car handles and rides well, the car is taught and precise on the road whilst remaining a comfortable GT car. The suspension is in good original order, having benefitted from ongoing maintenance and servicing as and when required throughout the cars life. The car stops as well as it goes, the brakes have ample power and all discs and pads are in good order. 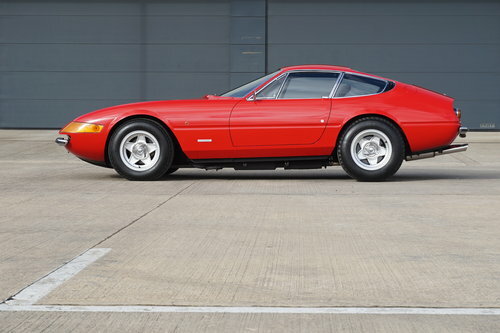 This is a rare opportunity to acquire a very well sorted example of the achingly Beautiful Ferrari Daytona, complete with a simply amazing history file, celebrity ownership and presented in its original specification that drives sublimely. 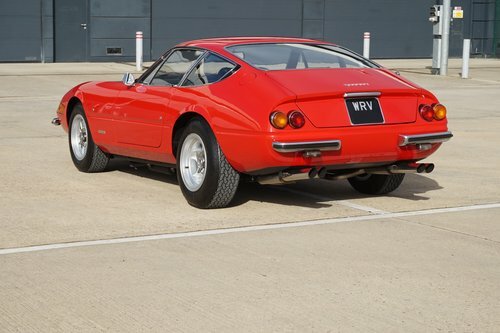 The Ferrari Daytona will likely prove to be a fantastic long term investment both financially and in terms of the enjoyment that these cars provide.